Yesterday our gorgeous girl turned four years old – and I can still hardly believe it. This probably sounds a bit daft, but to me four sounds so much older than three. Four is no longer a toddler and Lucia loves to call herself a big girl. This past week has been one of excitement as she has counted down the days to her birthday so she could be four just like her best friend. 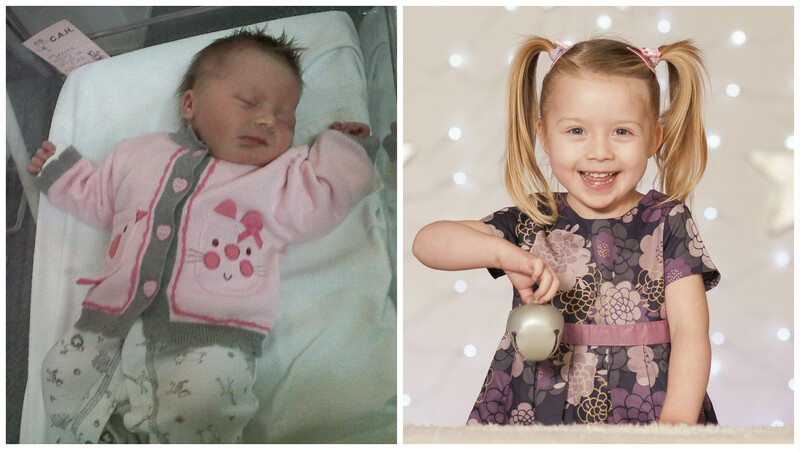 Every morning she’d wake up and tell us how many sleeps to go until the big day – though that morning she still double checked to make sure she was officially four! It has been a busy weekend of parties, presents and lots of cake and in her words she had ‘the most awesome birthday ever!’. Yesterday also marked the second birthday of this blog – and it is something I am really proud of. I love writing it (though sometimes it can be hard to find the time!) and feel privileged to have been able to meet some wonderful people through it who are a fantastic source of support and advice whenever we need it. So here’s to the next year of blogging and a happy birthday (one day late) to our happy, kind, funny, smart, determined and inspirational little girl. Since Lucia was first diagnosed with Lymphoedema at four months old, Daryn and I have consistently scoured the internet looking for something that might make a real difference to her condition and ultimately bring about a cure at some stage in the (hopefully) not too distant future. We regularly discuss new research with Lucia’s therapist Lynne who has a wealth of knowledge of anything new happening in the Lymphoedema world, and there really is a lot of exciting studies taking place all over the globe. A lot of these studies and surgeries are based on Secondary Lymphoedema but we still very much hope that in time there will be a break through in Primary Lymphoedema – but for now we have had our own break through and it has made a huge difference our lives. Last October Lynne met up with a company called Physiquipe to look at a machine they were hailing as ‘the gold standard for Lymphoedema’. A very big claim – but definitely worth looking into. Science bit: The PhysioTouch enhances the efficiency of the lymphatic system by creating a negative pressure in the treatment head, stimulating lymph flow. In our language: The treatment head acts like a little vacuum that lifts the skin with gentle suction allowing room for the fluid to flow. Lynne then took loan of a PhysioTouch machine to trial in the clinic and she asked if we would like Lucia to be one of the guinea pigs. We jumped at the chance as we knew that it was completely non-invasive and very safe – so why wouldn’t we give it a try? The first day Lynne used this machine on Lucia was simply unbelievable. It exceeded all of our expectations and then some on top of that. In less than an hour of the PhysioTouch being used on Lucia’s legs and feet it was as if I was looking at a different child’s limbs. Lucia lay up on the physio bed watching kids tv and eating chocolate buttons while Lynne got to work. She was a little bit intrigued at the start with the ‘sucking’ feeling, but otherwise it didn’t bother her at all. Her right leg and foot were worked on, up and down from thigh to toes a number of times with particular concentration on the most swollen and firm parts of her lower leg, ankle and top of her foot. When the treatment had finished we both could hardly believe the results. Lucia’s legs felt so soft and supple. The firmness, tightness and heaviness had gone. The skin that usually felt so taught and thick from being stretched across swollen areas felt lighter and more relaxed. We could see calf definition, feel and see her ankle bone, feel and see the bones in the top of her foot and her toes which usually appear short and ‘squashed’ with the constant gathering of fluid were actually beautifully long! It is hard to describe in words the massive differences to her legs and feet – both aesthetically and physically. I think I was in shock – I couldn’t wipe the smile or happy tears off my face as the realisation of the potential of this machine hit me. 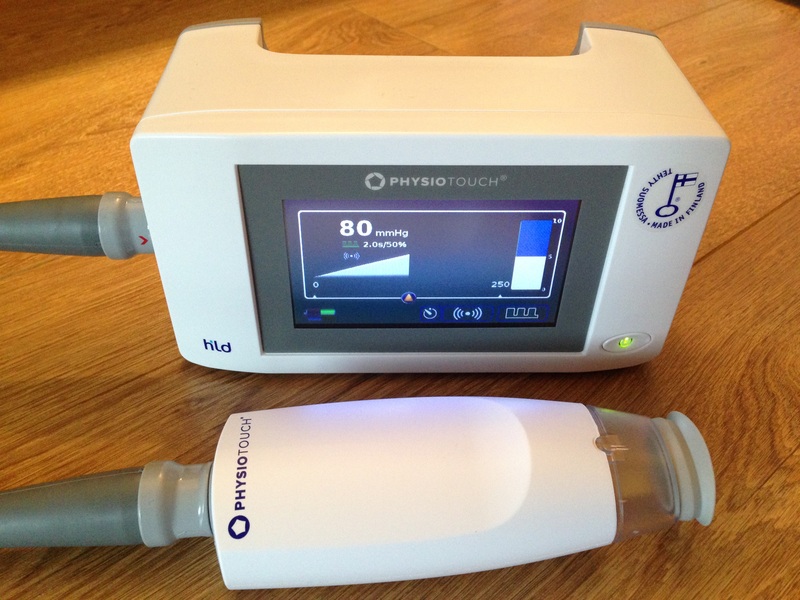 We got to use the PhysioTouch 2-3 times a week in the clinic for about a month – until the loan was over. And during those few weeks the change in Lucia’s Lymphoedema just kept getting better. The firm areas continued to become softer, her leg became more shapely, her foot was flatter on the top, a bit of an arch started appearing and when I held her leg it actually felt lighter too. We went shoe shopping a few weeks after starting the machine and the swelling in her feet and ankles had reduced so much that she fitted into the most gorgeous pair of pink bunny boots by Clarks – you can see them here. And then we got the message that the machine was being moved on to a different clinic. My heart fell into my feet as I knew it would be such a huge loss to us. The way this machine moved the fluid was unreal. That horrible, stagnant, protein rich, bacteria filled fluid that gathers in her lower limbs was being moved and draining a hundred times better than the simple lymphatic drainage massage we had been carrying out. As days turned into weeks without the PhysioTouch the fluid crept back in again and pretty soon we were back where we began. We could see and feel the difference. After a couple of weeks the pretty pink boots no longer fitted. Her right leg felt thick and heavy again. Her foot became so swollen and her little toes puffy. We could no longer feel her ankle bones and any shape had gone. Seeing the impact this machine had made on Lucia’s Lymphoedema was huge – and it also impacted on our lives too. We knew we needed our own personal one. The PhysioTouch was the best Christmas present ever! It arrived in December though we didn’t get it home until January as that is when we had our official training by Physiquipe on how to use it. We then organised a routine with Lynne – when to use it, for how long and technique. Our current routine is: Wednesdays, Thursdays, Saturdays and Sundays we use the machine for 40-45minutes. All in all it takes just over an hour from machine set up, actual treatment and post treatment skin care. On the days we don’t use it we still do some lymphatic massage on her, particularly on her right foot to keep things moving. When deciding on our routine we had to take into consideration the side effects that we had discovered during the initial trial. Lucia had a lot of nightly wakings which we think were due to her legs and body feeling restless. The extra fluid movement must have felt strange for her and being only 3 years old how could she tell us? She also needed to use the toilet a lot more so clearly the fluid flowing around her body was having an impact on other organs which we needed to be very careful of. We needed to ensure her kidneys weren’t being put under too much strain dealing with all of the extra fluid. Tiredness is also a side-effect as her body is having to work so much harder than before to cope, but she is slowly adapting to that. So far this routine seems to be working well – after approximately eight weeks the results are fantastic. We are also getting more confident using the machine, knowing what areas to spend a little more time on and what settings to use depending on how her swelling is on any given day, as there are always fluctuations. Ultimately this machine has changed all of our lives and I cannot recommend it highly enough. We are ecstatic that there is finally a treatment that has broken through that actually makes such a significant difference. We have even managed to get another TWO pairs of shoes! It is by no means a cure, but it definitely goes a long way in ensuring that Lucia’s Lymphoedema progression slows down and that we can maintain it at the level it is currently at. And that is worth its weight in gold. Find more details on the PhysioTouch you can visit the Physiquipe website here.